Today I spent wandering around the 17th Biennale of Sydney with three of my best friends. Frankly, most of the contemporary visual art that we saw (mostly at MCA) was pretty lame, especially the junk masquerading as “video art”. Apart from Bill Viola’s work at the MCA, it really is self-indulgent, second or third rate rubbish in my opinion. What we saw at MCA is from all over the place and not just Australian, so in saying that it is mostly rubbish I guess the problem stems from poor curatorial selection because it isn’t indicative of the state of Australian contemporary art practice. I have better contemporary art hanging on my walls at home. The Biennale selections just don’t rate for me, nor did they compare with the quality of work still on display at the State Library of NSW in their One Hundred exhibition. In that exhibition there is something for everyone from Banks’ HMB Endeavour journal to a really beautiful illustrated letter from Brett Whiteley to his mother. I’m so glad that I didn’t miss this great exhibition. 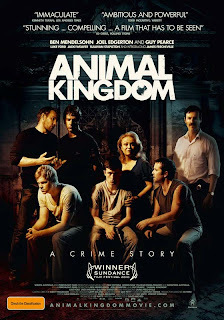 Later on we went to see the brilliant Australian film Animal Kingdom (see image & link to the film website). It deserves all of the rave reviews it is getting and Jackie Weaver deserves some big acting award for her portrayal of the convincingly disturbing crime matriarch, Janine “Smurf” Cody. She is seriously creepy. It is a big leap above the recent spate of TV crime dramas that are based on real events in both Melbourne and Sydney. It is more relaxed in the way it portrays the story and it looks so much better. The acting is better, the direction and writing is superb and the film just works so well. It is easily the best Australian film I can remember seeing for a long time. The violence in the film is both direct or inferred and you never quite know when it is going to happen, or not. There is a lot in its title and they manage to stay true to that right up to the final scene. I also liked the way they frankly portrayed the lives destroyed by crime and the fact that at some stage most criminals make a big mistake or come undone. They are not all brain surgeons or lucky for their entire lifetime. Don’t miss it and see it in a cinema, not on DVD.